Address: 51 K. Stoilov Str. Hebros Hotel is situated in the heart of the Ancient Plovdiv, a few minutes walk from the commercial center of the town, in a 19th century renaissance house. 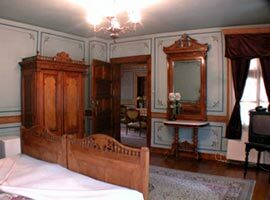 Restored in 1999 the building combines the romantics of the past centuries with all the extras of our time - satellite TV, air-conditioning, sauna, jacuzzi. 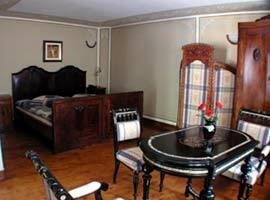 The six rooms of the hotel are furnished with authentic antique furniture and each has its own style. In the haet /lobby/ on the second floor you can meet friends or listen to the sound of 150 years old "Berger" piano. The restaurant with stone paved garden under fig trees and vines offers dishes and wines from the region and abroad. 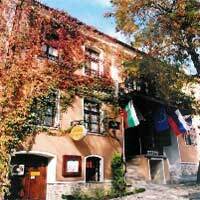 This is also a place where one can enjoy the art of famous Bulgarian artists and musicians. Hebros is style, coziness, hospitality and professional service that make the visitors to come back again. The interior is dominated by the secretaire a masterpiece from 19 th century. The spirit of the past is preserved by the "a la frangas" /decorated niches/ typical for the Renaissance house. The nacre engraved lounge and the screen are crafted in 19 th century. 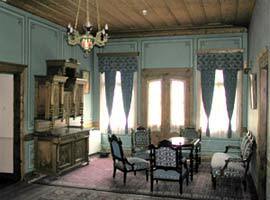 In the traditional old house this was the place to receive the guests. Today the haet /lobby/ is used for business meetings and cocktails. The restaurant offers a good selection of Bulgarian and international dishes prepared with fresh seasonal products. 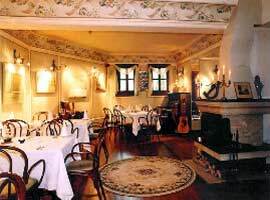 In Hebros restaurant - you can taste the finest Bulgarian wines served with matching dishes. 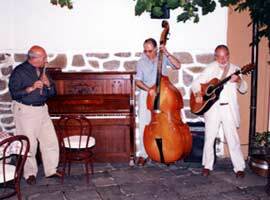 Hebros is a place where you can also listen to famous jazz and blues musicians.